Over the weekend, hundreds of migrants tried to breach our border at the San Ysidro crossing near San Diego. These invaders pelted Border Patrol agents with rocks and bottles, so tear gas was deployed. President Donald Trump was criticized for doing the exact same thing as former President Barack Obama. However, Obama’s use of tear gas was far worse than originally reported, and a long list of Democrats gave him a free pass. Democrats reacted with predictable faux outrage because they are on a mission to “resist” President Donald Trump and anything he does is an atrocity in their minds. Also predictably, the Obama administration had done the same thing and liberal lawmakers never uttered a word of disgust. As it turns out, under Obama tear gas was deployed at the border on an almost monthly basis. Oh, the horror. 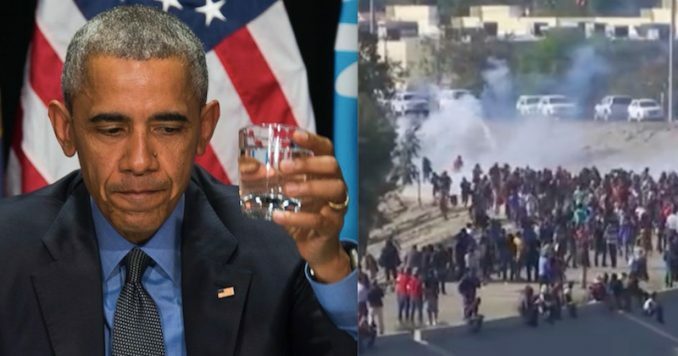 This report doesn’t give specific numbers for most years Obama was in office, but what data is available shows his administration used tear gas at the border at least 56 times. For some reason, there were not 56 separate liberal freak-outs during Obama’s time in office. Actually, that reason is because Obama is a Democrat and liberals only have a meltdown when Republicans do things, even if its something one of theirs has also done. Hawaii Senator Brian Schatz has been in office since 2012, meaning he was around when Obama was prez, but he was never alarmed back then. However, with Trump in charge, the Democrat suggested that Trump had used “chemical weapons” on women and children, in violation of international law. What happened over the weekend in the #SanYsidro Port of Entry is unprecedented & horrifying for the U.S. Pictures of children crying & running away from tear gas were devastating. Those crossing the border are fleeing extreme violence & poverty, situations out of their control. The truth of the matter is, there is absolutely no difference between President Donald Trump’s border security and immigration enforcement policies and Barack Obama’s policies. Obama separated families at the border and put kids in cages. Obama deported so many illegal immigrants that it earned him the nickname the “Deporter-in-Chief. And yes, Obama deployed tear gas against migrants trying to storm their way into this country. Democrats need to find something else they can pretend is outrageous.